The UAMS Proteomics Core specializes in discovery-phase proteomics. Discovery-phase proteomics refers to the large-scale identification and quantification of proteins or protein posttranslational modifications from a complex biological sample such as cells in culture, tissues, or plasma. High-resolution, rapid-sampling mass spectrometers operating in a data dependent mode (i.e., collecting data in real time) are the foundation of discovery-phase proteomics. Discovery phase proteomics generally utilizes 10s of samples and generates 1000s of candidate proteins for follow-up studies. The UAMS Proteomics Core provides the service of protein characterization by mass spectrometry. This includes identification of unknown proteins, quantitative comparison of proteins in biological samples, and mapping of post-translational protein modifications. We offer the services described below on a fee-for-service basis to both University of Arkansas for Medical Sciences (UAMS) and outside investigators. For more information regarding sample submission or data analysis, please email Proteomics@uams.edu. A member of the lab will contact you to discuss facility usage in more detail. For more information, see our iLab page. Protein Identification. Proteins derived from analytical purifications or complex biological samples are identified by LC-MS/MS following reduction, alkylation and digestion of protein samples with trypsin. High-throughput identification of thousands of proteins can be achieved by analyzing entire gel lanes (GeLC-MS/MS) and by strategic selection of chromatographic gradient parameters. Alternatively, proteins can be digested in solution and resolved by off-line reverse phase chromatography prior to LC-MS/MS. Proteins are identified from raw data by database search using the Mascot Server, and results are compiled using Scaffold. Mapping of Post-Translational Modifications. Posttranslational modifications can be identified and localized by modification of the LC-MS/MS protein identification procedure described above. Masses of post-translational modifications are included as variable modifications in Mascot searches and incorporated into Scaffold files. SILAC. Stable isotope labeling by amino acids in cell culture (SILAC) is a method for accurately quantifying changes in the expression of large numbers of proteins simultaneously in cell culture. An experimental culture is grown in a medium containing one or more amino acids labeled with heavy isotopes. Protein from the experimental culture is mixed in a 1:1 ratio with protein from an unlabeled control culture prior to further sample processing, trypsin digestion, and LC-MS/MS analysis. The high-resolution Orbitrap mass spectrometers described above are used to determine ratios of labeled-to-unlabeled peptides. The high-throughput protein identification methods described above can be used to perform quantitative comparisons. Custom service. Often investigators will require some hybrid of the above approaches or completely distinct approaches. The Proteomics Core can work with individuals to develop an approach or to customize instrumentation parameters to provide the best possible data collection and analysis. Label-Free Protein Quantification. Relative quantification of proteins in complex samples can be done in a label-free manner using sophisticated data analysis software, such as Mascot and MaxQuant. Quantification by spectral counting is performed using Mascot or MaxQuant and works by comparing the number of MS/MS spectra assigned to each protein in a sample. Quantification by precursor intensity is performed using MaxQuant and determines peptide and protein abundances directly from chromatographic peaks in the raw data. This intensity based quantitation is calculated using the iBAQ algorithm, which sums the intensities of observed peptides and normalizes against the number of peptides in the protein that are predicted to be observed in a mass spectrometry experiment. Data are compiled into Scaffold Q+S. Additionally, the Proteomics Core maintains the PEAKS Software Suite (Bioinformatics Solutions; v7.5), which includes a de novo sequencing engine, database search engine, quantitation module and variety of data visualization tools. Offline High pH Reverse Phase Peptide Fractionation. Standard LC-MS/MS analysis utilizes acidic conditions to promote peptide ionization. Prior offline fractionation of a complex protein digest improves the depth of proteome coverage by reducing the complexity of each fraction. Using different pH ranges for the successive offline and online chromatography steps is particularly effective because it allows a near orthogonal two-dimensional separation of the original complex sample. The use of high pressure UPLC high pH reverse phase fractionation is preferred as a first dimension because of the efficiency of peptide separation and the ease of concatentation of the first dimension fractions. Typically, the high pH fractions are concatenated into 8-30 pooled fractions each containing early, mid-range and late eluting peptides, the number of fractions is dictated by the complexity of the peptide sample. This ensures that each fraction analyzed by LC-MS/MS has peptides eluting over the full range of hydrophobicity, and that instrument time is not wasted analyzing regions of the gradient where there are no peptides. The offline fractionation is performed using the UltiMate system. Orbitrap Fusion Mass Spectrometers. 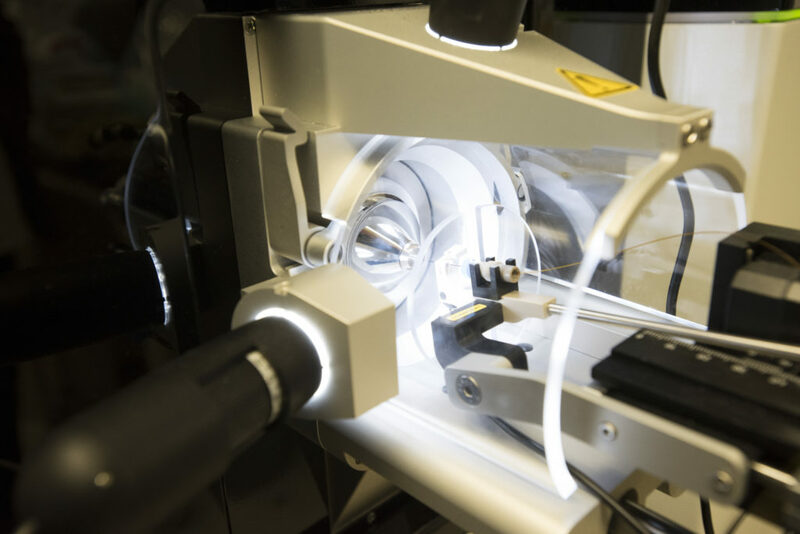 The Thermo Orbitrap Fusion Lumos system is the latest generation of the state-of-the-art Orbitrap mass spectrometry technology installed at UAMS in July 2017. The Proteomics Core also operates two Orbitrap Fusion Tribrid instruments installed in 2015. The Orbitrap Fusion Tribrids combine a quadrupole mass filter with Orbitrap and linear ion trap mass analyzers in a novel configuration that maximizes ion transfer efficiency, allowing flexible combinations of different fragmentation techniques, scanning modes, and mass analyzers. The quadrupole mass filter allows precursor ion selection, enabling parallel use of the mass analyzers and synchronous precursor selection for MS3 analysis. An ion-routing multipole serves as a higher-energy collisional dissociation (HCD) cell and also transfers ions efficiently between the Orbitrap and linear ion trap mass analyzers, allowing use of either mass analyzer in combination with any ion fragmentation technique. The ultra-high-field Orbitrap mass analyzer has a resolving power of up to 500,000 FWHM and 17 Hz scan rate. A linear ion trap performs collision-induced dissociation (CID) and electron-transfer dissociation (ETD). LTQ Orbitrap Velos Mass Spectrometer. The Thermo LTQ Orbitrap Velos is an earlier generation of the Orbitrap technology that has been maintained and operated by the Proteomics Core since 2011. This instrument system combines the rapid data acquisition capability of the LTQ linear ion trap with the high resolution of the Orbitrap. nanoAcquity Ultra Performance Liquid Chromatography (UPLC). Each of the mass spectrometers described here is interfaced with a Waters nanoAcquity UPLC system, including a binary solvent manager and a sample manager. Precise chromatography is achieved by these systems through low detector cell volume, minimized tubing volumes and specialized fittings. The binary solvent manager and injector can sustain pressures up to 15,000 psi and can generate high-pressure gradients at nanoliter flow rates with minimal delay. The sample manager can accommodate two 96-well plates in a microtiter plate format. UltiMate 3000 Binary Analytical LC System. The Thermo UltiMate 3000 System is capable of precise and efficient offline fractionation of complex protein digests. This system is used in the Proteomics Core workflow to fractionate peptides at basic pH in order to complement the acidic pH separation performed during liquid chromatography-mass spectrometry/mass spectrometry (LC-MS/MS) analysis. The UltiMate 3000 can sustain pressures as high as 15,000 psi and flow rates as low as 50 µL/min. The system includes an analytical autosampler and fraction collector to allow efficient processing of large numbers of samples, as well as a UV detector to monitor peptide elution and prevent cross-contamination.